James O’Driscoll was born and raised in Dublin. He trained as an actor in the prestigious Birmingham School of Acting, and then lived and worked in London for a few years. Prior to returning to Dublin, James completed two feature length films, the latest “Act/or” has just reached completion and is currently screening in Budapest and London. 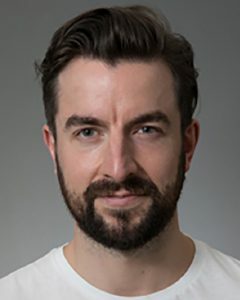 Since returning he has worked with Grace Dyas, Jason Byrne (Loose Canon), Conor Madden, Neil Watkins and many other auteur of Dublin Theatre. James has also written and acted in festivals such as Collaborations, Theatre Machine and the Dublin Fringe. Last year’s “Whichever1ufeed” was the first ever act to be performed in the Fumbally Stables space and was a sell out show. Most recently James toured Nationally with THEATREclub and their award winning show Heroin and can be currently seen in the latest Ulster Bank advert. Standing at a nice clean 6′, James is very fit and keeps in shape year round. He will be performing the in THEATREclub’s It’s Not over in this year’s Dublin Theatre Festival.